I’m a strong, successful woman—I swear! The hipster waiter keeps calling me “dear,” and it bugs the hell out of me. He’s so young that if I were twice his age, I still wouldn’t be that old. Cut the ‘dear’ crap! I want to shout. I’m a strong, successful woman! Even Grant sympathizes with me, and he never sympathizes with me. Take my present bout of tennis elbow. I get no sympathy. None. But then Grant has been subjected to so many of my loudly broadcast false alarms in the past—the Great Tapeworm Panic of 1997 comes to mind—that no wonder he and my other friend Lary think I’m making this up. “Can you please stir my coffee for me?” I ask Grant, my good hand holding the cup. “I have tennis elbow!” I holler. “Tennis elbow is totally a thing!” I cry, holding my right arm toward him. “Please rub it. Please. Puh-leez.” But it’s like asking a crocodile to perform a face-lift. Lary doesn’t touch people unless it’s to push them off a subway platform or something. “You don’t even play tennis,” he says. I did not get tennis elbow from playing tennis. I got it from forgetting I’m not invincible. Why call a plumber? I recall thinking. I’ll fix this toilet my own damn self. 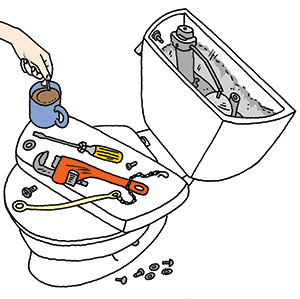 In case you’re unaware, fixing toilets entails a constant succession of twisting things—the bolts from the tank, the flush valve from the thingy, the doohickey from the dealydob—but I hate calling plumbers because I hate strangers in my house. I used to call Lary to come fix things like this, but he’s done so many similar repairs for me so many times in the past that he’s right in insisting I should know how to do them myself by now. It took me all morning, and an actual hacksaw was involved, but I fixed the toilet in semi-record time. I was in a hurry to catch a flight, and my friend Kirsty had this maddening requirement that there be functioning plumbing in order for her to house-sit my place. A shout-out to the nice customer at the Edgewood Lowe’s who helped me select the correct jiggy flip to fit into the nibby nob, because without him Kirsty would have had to do her business in the backyard alongside my dogs for five days. My arm seemed fine that first day. It wasn’t until the next morning at the hotel that the simple act of lifting a coffee cup could drop me like a shotgun. OMGah! What the hell is this? I thought, rolling on the floor, wailing like a sick sea elephant. It got so bad that I couldn’t even push the elevator button without screaming. My daughter didn’t see the problem. Kids are visual; they don’t think you’re hurt unless they see you hemorrhage bloody geysers from your jugular. And simply proclaiming you’re in pain will garner eye rolls so big it’s a wonder they don’t flip over backward. The first worst part of tennis elbow is the fact that it’s called “tennis elbow.” It should be called “hatchet elbow” or “railroad-spike elbow,” something in line with how much it actually hurts. Telling people you have tennis elbow doesn’t sound like a good enough reason for all the assistance you’ll be forced to beg for during the two weeks before it goes away. “Help, I have tennis elbow and I can’t lift this!” I probably heard myself say twice before I decided it was better to just look lazy and leave my tray on the table or my items on the floor where I accidentally dropped them. The other worst part is that your arm appears to be perfectly functioning. It’s not even hardly swollen. It looks like any other healthy arm, only yours happens to be packed with a million invisible switchblades that stab you when you try to do anything normal, like brush your teeth or open a car door. So basically you’re standing around and, at turns, wailing and complaining, then angrily insisting you’re not helpless—you just fixed a broken toilet by yourself, dammit. So now I’ve gone from complaining about the pain to complaining about my friends’ wholesale minimizing of said pain. At this point I don’t blame them; I can’t even stand myself. I’m considering using my hacksaw to cut my arm off above the elbow. I’ve become so unbearable to be around that my friends have left me alone in the diner to stew in my self-pity. “Anything else, dear?” the waiter asks. This article originally appeared in our April 2014 issue.